How many people in this world have a name that is confusing? You know the ones no one can spell or pronounce correctly? The ones that, nine times out of ten, most people look at you funny for? Did your parents decide that “oh, this is a cool name!” but now that you’re older and having to deal with the repercussions, it’s extremely annoying? And don’t forget the pronunciation! From ‘uh-lish-uh’, ‘uh-lish-ee-uh’ to ‘uh-lee-shuh’ no matter how people say it, I find I’m always correcting someone. 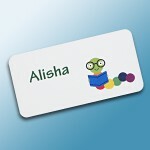 To be exact, my name is Alisha and it’s pronounced ‘uh-lee-shuh’. I’ve been correcting people since I was in grade school at the spelling and the pronunciation; and it’s getting tiresome. I’ve had a friend named Alicia, one named Alysha, and even at one point a roommate named Alysia! 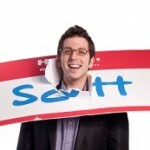 While one doesn’t necessarily need to be exactly like Scott Ginsberg, the Nametag Guy, (he wears a nametag each and every day) nametags and name badges do help with getting acquainted with others. 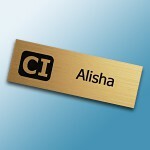 This might be the simplest form of a name tag, a laser engraved plastic one. This is on euro gold with black text, 1×3 inches and simply engraved with my company’s logo and my first name. Each of these tags can be customized to meet whatever need is there. Logos, names and titles can be included. 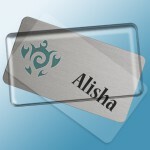 The second name tag is a UV Color logo on engraved plastic; white with pine green text. Each UV Color logo is printed with a full color process that allows for quality, high resolution images and are great to show gradients and bright colors. Names and titles are engraved into the plastic to show the second color. The final name badge is a Mighty Badge. These reusable badges are available with or without a logo. Each logo is UV printed and names can be added by printing on the clear, plastic lens. There are three pieces to the Mighty Badge: the metal plate, the clear insert and a clear lens that snaps it all together. Regardless of spelling, pronunciation or other abnormality, names are fun and should be celebrated. Each person should find a way to enjoy their name. Oh, and don’t forget the ever repeating androgynous names like Pat, Jesse or Taylor; you will never be forgotten!